Hello sports fans. This is Tres Smith an avid recreational cyclist from by God, Ruskin, Florida and I am getting ready to assault Bubba’s Pampered Peddlers Coast to Coast ride, C2C, from San Diego, California to St. Augustine, Florida from March 5 to April 25, 2016. I have trained extensively over the last six months and that round middle that everyone sees in that picture to the right has melted off and I have lost approximately 30 pounds since my decision to attempt this life long dream. It must be interjected early that there was no fast fix or miracle cure. It was a dedicated daily effort to manage a healthy diet and an extensive training program of riding and resting to ensure balance and recovery. In my day job, I am a registered nurse with a certification in rehabilitation nursing and had spent 20 years in the clinical setting at the local rehabilitation center and now have worked almost 9 years as a catastrophic nurse case manager. The bicycle, among other activities: officiating wheelchair rugby, coaching wheelchair softball, sprint triathlons, kayaking, backpacking, hiking, snorkeling in exotic places and traveling, has been the sanity machine that allows me to keep on, keeping on. I had previously toured with the Alaska AIDS vaccine ride from Fairbanks to Anchorage, Make a Wish triple centuries weekend in Michigan and 8 Bike Florida rides. There are so many people to thank who have supported me in following my dream. The first and foremost appreciation of thanks naturally goes to my lovely wife, Mariella Smith, without her none of this would be even possible. She will be joining me along the way in west Texas and the Florida panhandle. I am so very grateful for her support along the route and in our home for over 29 years. My employer, Ms. Betty Reid of Rehabilitation Advisors, for even allowing me the time off to pursue this vision quest. I have a wonderful boss who understood me well enough to know how important this was to me. All my local friends and family for their ever constant unconditional support in this and any other endeavor that I seem to take on no matter how crazy it may seem to them. There had been some discussion amongst some of my closest friends, including the Four Horseman of the Apocalypse, about a concerning lack of sanity in the past about some of my ideas. You KNOW who you are. I do believe they will change their minds after this journey. There are a few quick shout outs that need to addressed. The community of friends, athletes and referees in the sport of wheelchair rugby, particularly the USQRA and USQRRA, that always have seemed to support me in anything I do. You are simply the best. The Tampa Bay Wheelchair Rays softball team for just being themselves and allowing me to hang out along the way. Must be Nationals! All my local hand-cranking road buddies, too. The beautiful bike that Carl Strong hand built for me and that I have enjoyed for the last three years or so. There is a post on the blog about the build. The bike is custom and fits me like a glove. I have never enjoyed riding as much as I am now. A shout out to St. Pete Bicycle and Fitness for getting my bike ready particularly, expert mechanic Ted Lee and also local fit guru at St. Pete Bicycle, Paul Williams for dialing me in. Thanks everybody. 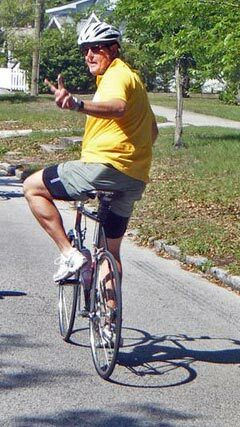 The second-to-last shout out goes to my local bike club, Sarasota-Manatee bicycle club, SMBC. I moved to Ruskin 17 years ago and I had been involved off and on with this club and other clubs for that period of time. Last fall, I recently reestablished my presence and attendance at club rides and training and it has been the best involvement I could have ever wanted to prepare me for this trip. There are so many skilled and fit cyclists to train with and emulate, like Mike and Claire. I have done over 3,000 miles in training and easily half those mile were done with Jim Wheeler’s 14-16 mph group. I have met great people, some who had toured extensively and I could pick their brains for info. The club also had classes that I could attend about teaching bicycle safety and performing it. I leave my local club with fabulous training and a head full of safety. I heartily recommend to anyone to get involved in your local bike clubs for advocacy, training and support. Thanks SMBC. The last shout out goes to Mr. Bob Ranta. Mr. Ranta is an elite age-specific marathoner and iron man triathlete. I met Bob when I first moved to Ruskin. Bob is the steadiest and smoothest bike athlete that I had ever ridden with, except for maybe Mike. Two birds of a feather. He is always optimistic, hopeful, positive and above all encouraging. He got my wife to do a sprint triathlon at Madiera Beach, Florida. No small feat. His mantra is “let’s start out slow and back it down from there.” Thanks, Bob.